In this big new book, financial astrologer Tim Bost uses ground-breaking new techniques and innovative analysis to explore Mercury in the markets in greater depth than ever before! GET YOUR COPY NOW AT A SPECIAL PUBLISHER'S DISCOUNT PRICE! You'll save 10% off the regular retail price, but only if you order now from this web site. "Let's face it. Traders in the stocks, futures, options, or FOREX markets are dead meat if they aren't profiting from the astro-trading advantage!" That's what Tim Bost, editor of FinancialCyclesWeekly.com newsletter and author of Mercury, Money and the Markets, says it takes to survive in today's increasingly treacherous trading environment. "I've been working with planetary factors in market timing for over a quarter of a century," he says, "and I've never seen the odds stacked against individual traders more than they are now. To compete with market manipulation on a massive scale and the onslaught of high-frequency trading robots, you've got to have market timing tools that give you the agility and tactical superiority of a trading guerrilla. "That's what astro-trading is all about, and that's the focus in Mercury, Money and the Markets. It's aimed at short-term swing traders who want to level the playing field with high-precision, back-tested timing methods that most market players haven't even heard about!" In Mercury, Money and the Markets, Bost reveals the impact of Mercury cycles on price trends and reversals in equities, precious metals, and international markets on 5 continents. He also provides detailed analysis of 30 major blue-chip stocks, showing the individual idiosyncrasies in their responses to repeating Mercury cycles. With dozens of charts and examples throughout the book, he makes a compelling case for the importance of this often-overlooked component of financial astrology, elevating it to a new level as a powerful market timing tool that can make the difference between disaster and success in high-pressure trading. But Tim Bost doesn't stop there. He understands that effective trading involves more than just knowledge of the markets and correct analysis of trading opportunities-- it also requires sufficient self-awareness to be able to maintain emotional equanimity under fire. So he adds plenty of unique information here about how astro-traders can use Mercury to better understand their personal horoscopes, gaining higher degrees of trading confidence. It's a perspective unavailable from any other source. 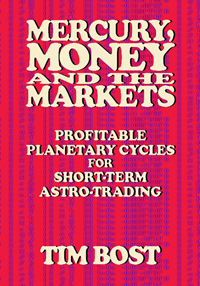 Because he's a pioneering astrological researcher as well as an active trader and trading coach, Tim Bost has uncovered significant planetary dynamics to take this advanced astro-trading sourcebook far beyond the common material found in most books on stock market astrology. It includes transneptunian factors, 90-degree dial analysis, nontraditional planetary angles and a great deal more. And it features tips on deciphering the trading code in W. D. Gann's strangest book, the role of Mercury in First-Trade horoscope analysis, and the money-making truth about the times when Mercury is retrograde. Mercury, Money and the Markets is also a book with lots of charm and intelligence. Bost is an excellent storyteller, so he makes the effects of Mercury come alive with examples from business, the markets, and personal experience. He also contributes his scholarly skill to this book, dipping back into the myths of antiquity to revive an ancient esoteric text that has surprising effectiveness in precisely timing trades today! This is a book to read and enjoy, and a valuable text filled with big payoffs for the active short-term trader. But it's also a book that you'll come back to again and again, since it features a unique cross-indexed Mercury Station Ephemeris that spans 201 years. In other words, while it's packed with energy and information you can use today for immediate profit, it has a long shelf life, too! If you're an astrologer looking for a way to make money, this may not be the book for you, since it's loaded with brass-tacks, down-to-earth insights about what it actually takes to profit from astro-trading. It will stretch your awareness well past the limits of what you thought astrology was all about. But if you're a trader who needs an extra edge, then run, don't walk, to get this book! Precision market timing tips from hidden planetary cycles. Back-tested cycles in precious metals and international markets. How to decipher the trading code in W. D. Gann's strangest book. Mercury's real trading-indicator role in First-Trade horoscopes. How you can profit from the atro-trading advantage. A secret trading technique from a mysterious ancient manuscript. How to identify the most profitable short-term trading opportunities. Dynamic factors in successful astro-traders' personal horoscopes. How you can successfully master the Trading Triad. The hidden side of central banks and global stock exchanges. How to pinpoint market turns with Mercury and the Transneptunians. The money-making truth about Mercury retrograde.